Lactose free - Not for patients with galactosemia. Great tasting oral supplement and tube feeding for children ages 1-10. Provides 100% of vitamin and mineral needs in 870 ml/1305 calories. Contains Benefiber, a soluble fiber to help promote normal bowel function. Rich in Calcium to help grow strong bones. Pediatrician approved - Approved by a panel of pediatricians. 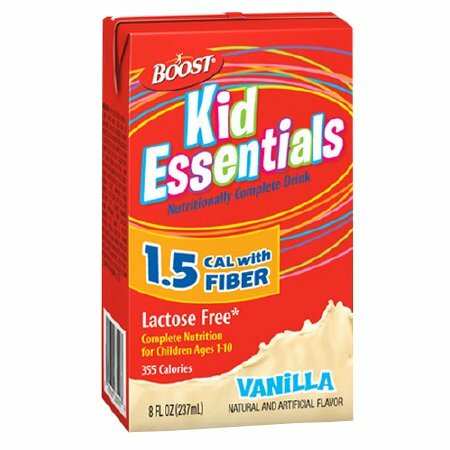 Resources Just for Kids 1.5 Cal with Fiber formula is a complete nutritional formula providing balanced nutrition for children. 870 mg - 3.7 briks - contains 1305 calories - 1.5 cal/ml - and meet or exceed 100% of the NAS/NRC RDA for protein and essential vitamins and minerals for children 1 to 10 years of age. Contains Soy Fiber and Partially Hydrolyzed Guar Gum. A Medical Food for children ages 1 to 10 who have increased caloric needs or are fluid restricted. Specially formulated for dietary management of malnutrition and other medical conditions when nutritional needs cannot be met through diet modification alone. Not intended for children under 1 years of age unless specified by a physician. Store at room temperature. Unused open portion should be covered and refrigerated; discard if not use within 24 hours. Follow physician's instructions. Feed at room temperature. Pour directly into tube feeding container. Adjust formula rate and volume to patient's condition and tolerance. Avoid contamination during preparation and use.